...to all my lovely crafty blogland friends for their lovely comments, emails, cards and gifts sent following the birth of our little man Thumper. I am sorry that I have not managed to reply individually to many of you yet. You can probably imagine why this is the case ;-), but please know that I really appreciate your thoughts and sweet comments. Yesterday I took photos of some simply gorgeous handmade cards that we have received here recently, and I thought I'd pop them up here and show them to you. This 'oh so cute!!' card is by my Kiwi friend Paula. Her bunny is so beautifully watercoloured...I just want to give him a big cuddle. Miss Nearly 7 is also a huge fan of this bunny, and I half expect to find him missing from the card one morning ;-). 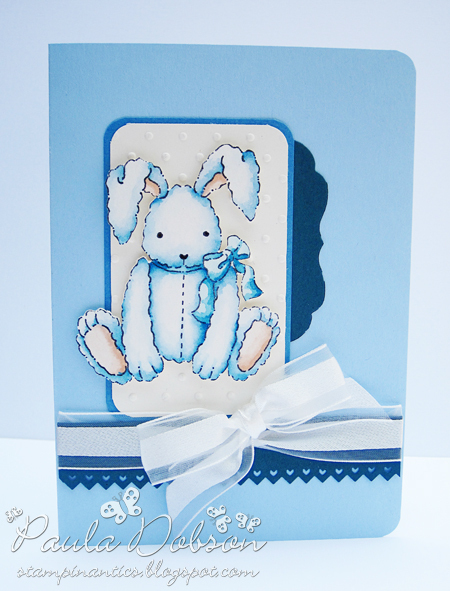 This fresh and elegant card is by the lovely Patrice. As an indication of how befuddled I am of late...when I opened this card (not long after receiving Paula's), and sat admiring it for several minutes I was also thinking...gee, I think I've seen this card before...but I couldn't put my finger on where. Suddenly it dawned on me that it wasn't the same card...but the same layout...YES, sleep deprivation is debilitating! Paula and Patrice are some of the awesome design-team talent behind the Just Add Ink blog, and both had made me their cards using the #56 sketch challenge. How chuffed did I feel to receive not one, but TWO JAI design-team cards in the same week!? Plenty chuffed, let me tell you. 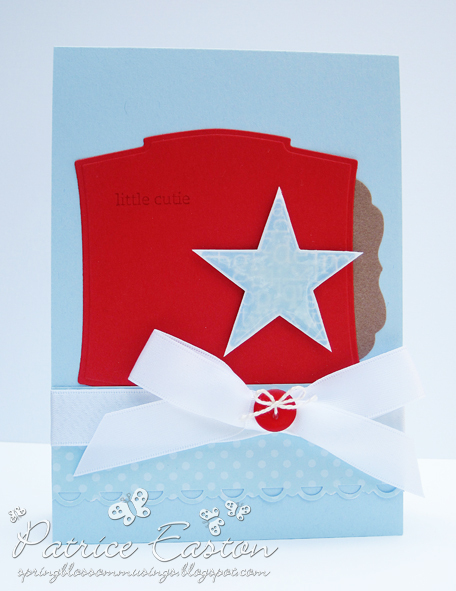 This super sweet 3D card is by the wonderful Leonie. I love 3D cards, and this one is no exception. How cute are those little drawers, and the goodies hanging from them? How patient must Leonie be to have cut them out by hand?! If I tried to do something like that right now, I'd probably slice my fingers off. Last but not least, this entirely gorgeous creation is by Debbie. When I grow up I want to be able to colour with Copics like Debbie. Her creations are all mini works of art...I am in awe! SO...as you can see, I have been a very lucky girl! Thank you so much for your beautiful creations ladies, I feel very special and you have all inspired me with your work. Last night we headed in to the Canberra Show. Our trip there has been a bit of a family tradition since the year before Miss Nearly 7 arrived, and with the the kids getting older they are enjoying it a whole lot more. So off we went and arrived at 6pm (it was hot and sunny here during the day and I decided that I'd rather have tired kids than hot, sweaty and possibly sunburn't kids). 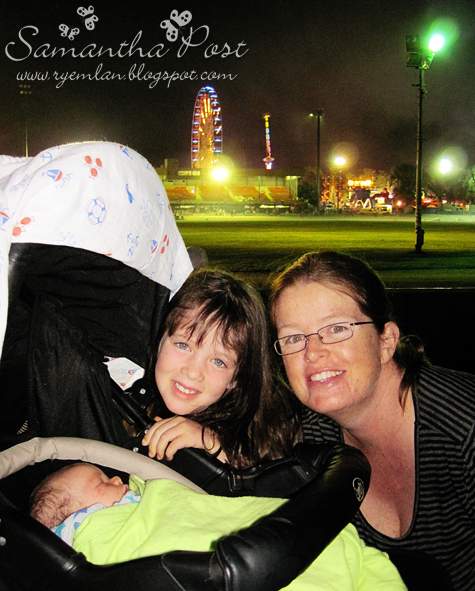 We had a lovely time meandering through the animal yards, craft pavilions and show bag stands, and finished up by having dinner on the grass around the main arena, followed by fireworks. I might add here that I didn't actually see the fireworks. Little man Thumper was a wee bit tired after waking and being fed, so I wrapped him up and was rocking him back to sleep DURING the fireworks...and guess what...I did it! I had his head in the crook of my arm covering one ear, and my mouth over his other ear as we had unknowingly parked ourselves quite close to the fireworks...and there I sat rocking to and fro while the fireworks went off over my head. He barely moved a muscle, although he did wake up screaming during the car ride home...sigh! 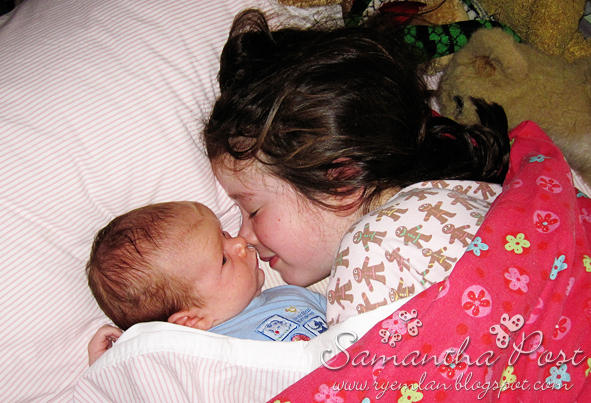 Aaaaaaaaw - what gorgeous photos of your little ones - and YOU! Gorgeous cards from everyone - and thanx for the compliment too - you made me blush!!! nice photo and words can't describe that. Lovely family and the cards are just gorgeous.